Troy Bishopp has been using grazing charts in managing his farm for the last three years. Here he describes how this $4 tool helped him survive the 2012 drought. You’ll also find links to grazing charts created to meet a variety of needs so you can pick the one that works best for you. In spite of the droughty conditions, and thanks to careful management, dry pastures still sent up green grass to feed the Bishopp family’s herds. This past grazing season, my family farm in Deansboro, NY teetered between a D1 and D2 (Moderate to severe) on the U. S. drought monitor scale most of last summer, testing my 26 years of grazing experience and thinking skills. Although I felt up for the challenge, at times it was highly stressful to manage a newly started organic dairy heifer custom grazing business without much snow or rain. Surprisingly, what saved me was a free grazing planning chart hung on my office door. I know what you’re thinking; a piece of paper (and not money) is credited with getting a farmer through the grazing season. Yep, but let me elaborate a bit. This change of managing through using better decision making tools has been a long time in the making, and it came at some expense as I dropped some coin to attend holistic management grazing planning workshops and to travel around visiting other successful graziers throughout the country. I also say expense because I have missed so many opportunities to manage grass more effectively because my pride, and lack of monitoring and record keeping kept me in observational mode instead of allowing me to become a strategic grazier. Then, on a trip to Missouri to Greg Judy’s farm, I saw the light. Greg showed me all the exciting things he was doing on the farm while quoting pasture recovery periods and moves, and suddenly I realized I needed to know how he made his grazing decisions. Greg ushered me into his office. It looked like a military war room with his wall covered with 3 years of planned grazing charts. He knew where he was, where he was going and where he had been, with paddocks, rest periods, weather info, animal dry matter calculations and major events like vacations, calving, breeding and stockpiling all in one cohesive chart. I started with Allan Savory’s Holistic Management Handbook and the grazing charts it included. Like many graziers, I found I had to tweak the chart to fit my needs and my environment. With practice, and based on feedback from other farmers who were also trying the tool, and with support from a Northeast SARE ‘Professional Development Project’ grazing training grant, l refined the charts, creating a variety of them useful to a variety of different operations. Since this is a living document we can include all kinds of information to help us make decisions. For example, are your rainfall records handy? I found that having moisture and temperatures listed in the columns on the bottom of the chart helped me predict forage growth. It also helped me with scenario planning, by giving me a crucial visual forage inventory as paddocks or fields were dropped or added. Typically a grazier’s brain can begin to hurt from planning for the “What ifs” “Whens” and “Hows:” “What if it doesn’t rain in the next two weeks? When do I supplement? How do I get more rest on the paddocks? When and where do I utilize a sacrifice area? How long do I want to graze into winter? Is there money in my account and what is my borrowing power? Do I have a destocking strategy? Etc., Etc.” Having my grazing chart helped me plan for all these scenarios because I could see my entire farm in front of me on the chart. The true test of my grazing planning and my $4 chart came during the 2012 weather freakshow. For me, this visual chart reduced stress by constantly informing me of conditions on the ground so I could plan weeks ahead of when I actually needed to speed up or slow down the rotation. There was a point from June 8th to July 22nd when we had 16 days over 90 degrees and only a ½” of rain. About June 24th I made a big circle on July 30th that said, “Decision Day.” On that day, 30 days before I would run out of grass, I knew I needed to decide if I was going to supplement with hay. Fortunately, on July 23rd it started to rain and for the next 21 days we got over 5 inches of rain. I never touched the emergency hay fund but I felt more relaxed knowing it was planned for if I needed it. Last, I stayed focused on things I have some control over. Focusing on the things you have no control over is a waste of time and energy and can cause a lot of stress. 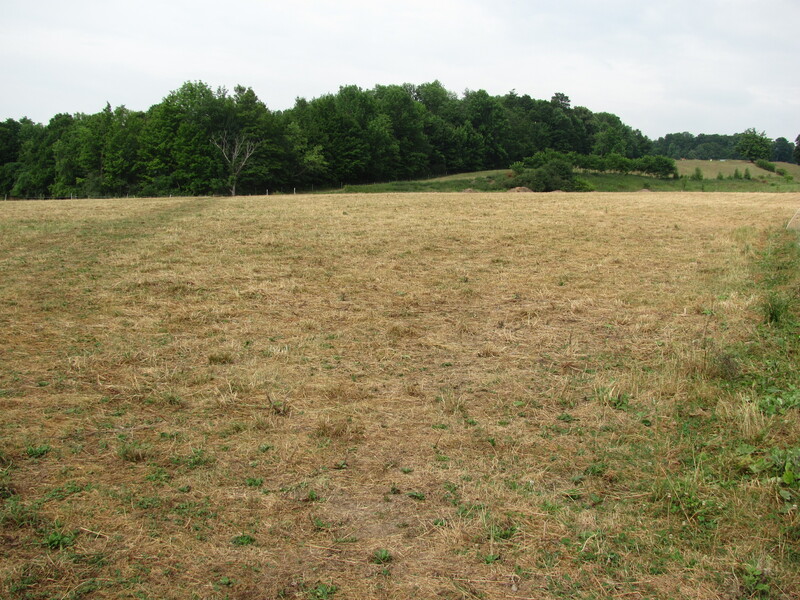 By monitoring my pastures, allowing longer recovery periods, and maintaining higher residual levels, when the rain finally fell, my pastures popped back like springtime. This was my reward for having planned ahead, not expecting it to rain, and using conservative stocking rates. You’re a hero when it all works the way it’s supposed to. Look close. There is a green lining to this cloudless sky! 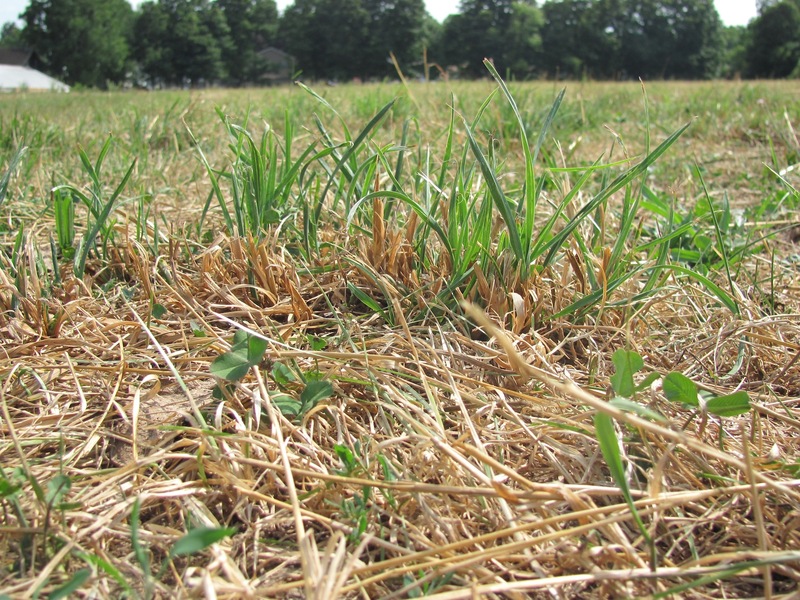 In the final analysis, simple grazing management decision-making tools and using your noggin may be more valuable than increasing outside inputs to solve the weak links in our grazing operations. A $4 piece of paper might be just the ticket to improve your overall health and profitability, or to get you through the next weather event. 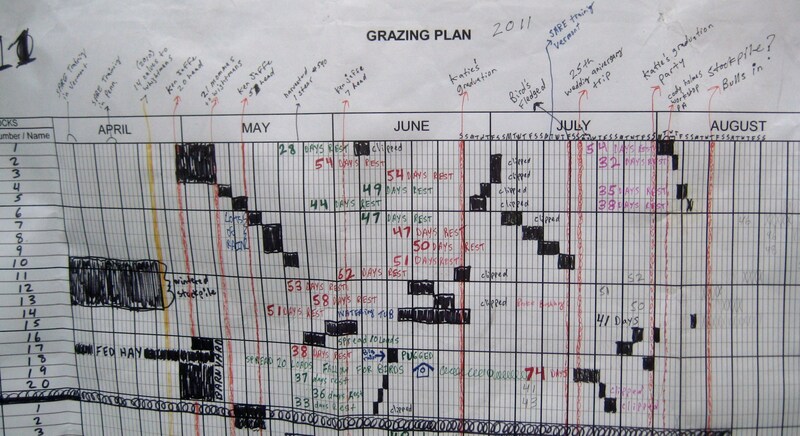 Ready to get started on your own grazing chart? Thanks to Troy and his Northeast SARE supported project, we’ve got them for you! Get your grazing charts here. Get Your Grazing Chart Here! I use temporary net fence for my sheep so a chart with fixed pastures would not work so well. I use a printed “map” of my property and draw in my paddocks as I move them, listing the dates in the margin. I start a new page/ map each month (or so) depending on how quickly the sheep are moved. Troy used to do that too he tells me. He switched to the charts because he felt like it was easier for him to track the number of days for regrowth, and to add in all the other parts of his life that he needed to schedule around. Just a clarification, the chart’s don’t require you to have fixed pastures. When Troy talks about paddocks or pastures he’s really talking about an area that he then divides into smaller grazing units using electric fencing. This allows him to be completely flexible about when and where he grazes and how long he’s in one spot.